How your ATAR is calculated is one of the most commonly misunderstood areas of the HSC, and it’s probably also one of the most poorly explained. What we don’t realise is that there is a lot more which goes to create your ATAR than merely marks; it’s how you performed against your cohort! A percentile is the indication of values below a given percentage of observations made in a group. So for example, the 20th percentile is the value below which 20 percent of the observations may be found. Your percentile is your position in a course relative to other students. This means that you are in the 80th percentile, 80% of the students have scored below you. Similarly, if you scored in the 63rd percentile, then you have done better than 63% of other students. This sounds pretty similar to how ATARs work, right? If you get an ATAR of 70.00, you performed better than 70% of your cohort. The difference here is that percentiles are used to calculate your ATAR (which is a percentile in itself as well!). Let’s see how NESA & UAC applies percentiles and how it affects your ATAR. Their HSC Results only differ by 10 marks, but there is a difference in their ATARs of 23.50. Why is this? Let’s Take a look at their percentiles. Both Fred and Laura took HSC Biology. Fred’s mark was 70, but his percentile was 41. This means he did better than 41% of those who took Biology for HSC 2015. Laura’s mark was 80, but her percentile was 75. Meaning she did better than 75% of those who took Biology for HSC 2015. So there is 34% of the HSC Biology cohort scoring between Fred’s mark of 70 and Laura’s mark of 80. Meaning that 34% of HSC Biology students in 2015 scored between 70 and 80. If you imagine 100 students took HSC Biology in 2015, this would mean 59 students scored higher than Fred, but only 25 students scored higher than Laura – even though they had relatively similar marks! Essentially, the higher your percentile, the better your ATAR. Why is my ATAR lower than my HSC results? This has to do with your percentiles in each subject, more so than your HSC mark in each subject. Fred’s marks in each of his subjects is much higher than his ATAR of 55.95. However, take a look at his percentiles for each subject. Fred didn’t land over the 50th percentile in any of his subjects, meaning over half the 2015 HSC cohort performed better than Fred overall. So it kind of makes sense that his ATAR ends up being around 50. However, if we look at Laura, most of her percentiles are close to or over 50, meaning she mostly performed better than half of the 2015 HSC cohort, so it makes sense that her ATAR is around 80. 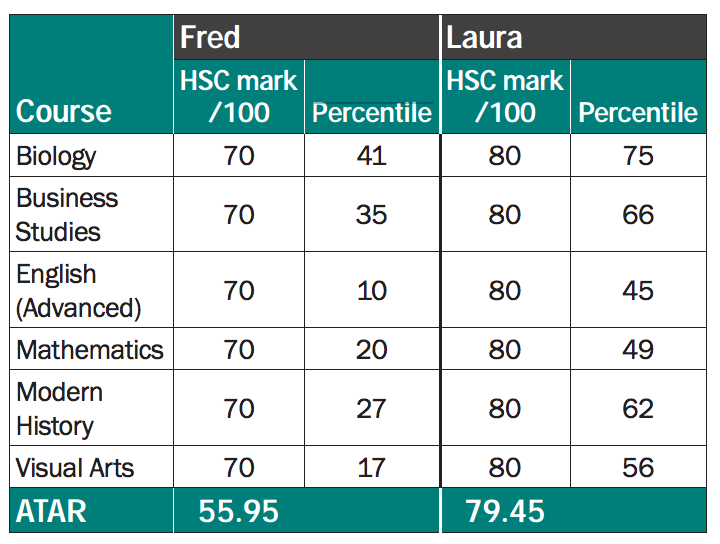 So Fred’s overall ranking within the 2015 HSC cohort was lower, and Laura’s overall ranking was higher – meaning they received different ATARs (ranks) despite a relatively small gap in actual HSC marks. My friend and I got similar marks, but our ATARs are different. Why?! This is again to do with the percentile. Let’s take some imaginary marks for Rowan and I for this example! Let’s take a look at Ancient History in particular. There are 3 marks difference between Rowan and my marks. With a mark of 78, I did better than 67% of those taking Ancient History. With a mark of 75, Rowan did better than 21% of those taking Ancient History. I know this sounds crazy, but think about what these percentiles mean. This means that 46% of those taking Ancient History received the mark of 76 or 77. This is why you and a friend might have similar marks in similar courses, but may have entirely different ATARs! What is a ‘mystery mark’? ‘Mystery mark’, ‘the asterisk’, ‘the red dot’. There are a lot of terms for it: an ATAR below 30.00. If you receive an ATAR between 00.00 to 30.00, you won’t receive an actual ATAR, instead, your ATAR Notice will read ‘30 or less’. However, if you haven’t met the requirements of gaining an ATAR, your ATAR Notice will read ‘Not Eligible’. Here’s where it gets interesting. The ATAR you receive can actually differ from the ATAR that universities use for admission! Wondering how Bonus Points work and how to use them to your advantage? Read on to Part 4 here! Need more help or have questions to ask? We can help you get your university preferences together, choose your university, apply for scholarships and more! To find out more and get started with an inspirational tutor and mentor get in touch today! Give us a ring on 1300 267 888, email us at info@artofsmart.com.au or check us out on Facebook! Elizabeth Goh isn’t a fan of writing about herself in third person, even if she loves writing. Elizabeth decided she didn’t get enough English, History or Legal Studies at Abbotsleigh School for her own HSC in 2010 so she came back to help others survive it with Art of Smart Education. She’s since done a mish-mash of things with her life which includes studying a Bachelor of Arts (Politics and International Relations) with a Bachelor of Laws at Macquarie University, working for NSW Parliament, and trawling through bookstores for old leather-bound books. Get exclusive HSC content & advice from our team of experts delivered weekly to your inbox! How to Study Smart and Improve Your HSC Marks! How Bad Do You Actually Want It?